The beads are smoky quartz blended with some citrine, plus the cut of these beads makes them unique. Light plays through the color of the beads and bounces back from the faceted sides. 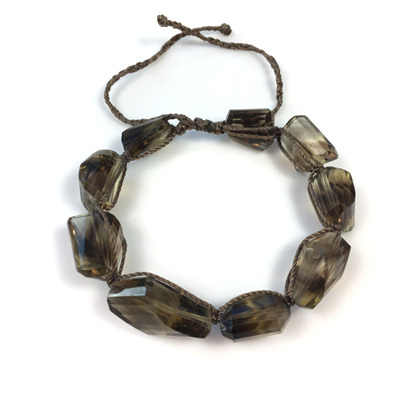 The bracelet is knotted and braided with nylon cord in a muted shade of sepia that compliments the smoky quartz-citrine beads. One size fits all. 9 smoky quatz-citrine beads knotted with nylon cord. Beads 15 to 20 mm long by 14-16 mm wide. Sliding closure. Adjust to wrist size.